Greenpeace's registration to operate in India has been cancelled, the environmental group said on Friday, marking yet another action which, it alleged, came under the directions of the Union home ministry as part of the crackdown on NGOs. Claiming that its registration as a society has been cancelled by Registrar of Societies in Tamil Nadu, Greenpeace India said the NDA government's "clumsy" tactics to suppress free speech was turning into a national and international embarrassment. The NGO said the fresh notice of cancellation of its registration was an extension of the "deep intolerance" for differing viewpoints which the government was "harbouring" and asserted that it would again seek legal "redress". 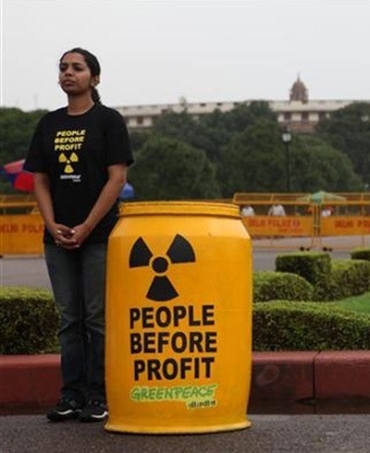 "Greenpeace India Society has just received notice from the Tamil Nadu Registrar of Societies, summarily announcing cancellation of its registration as a society," the NGO said in a statement. It said while several international leaders, including the United Nations Secretary General have recently upheld the importance of civil society in healthy democracies, this notice is the "latest assault" on free speech in India. "The RoS is clearly acting under directions of the home ministry in Delhi, which has been trying to shut Greenpeace India down for over a year now. The MHA's clumsy tactics to suppress free speech and dissenting voices are turning into a major national and international embarrassment for this government," said Vinuta Gopal, Interim Executive Director of Greenpeace India. It said for the last 18 months, Greenpeace India has endured repeated attempts at suppression through different government authorities. "This is an extension of the deep intolerance for differing viewpoints that sections of this government seem to harbour," Gopal said. She said the Registrar has passed this order without granting Greenpeace a hearing and without complying with the Madras High Court order to address each of our points and queries. "This is a blatant attempt to circumvent the legal process and shows no respect for the law. We are confident that we are on strong legal ground. We have faith in the legal process and are confident of overcoming this order," she said. It can be mentioned here that the Union home ministry had recently told Delhi high court that it cancelled the foreign contribution registration of the NGO as it was continuing to use its Foreign Contribution Registration Act (FCRA) accounts despite the suspension of the same.